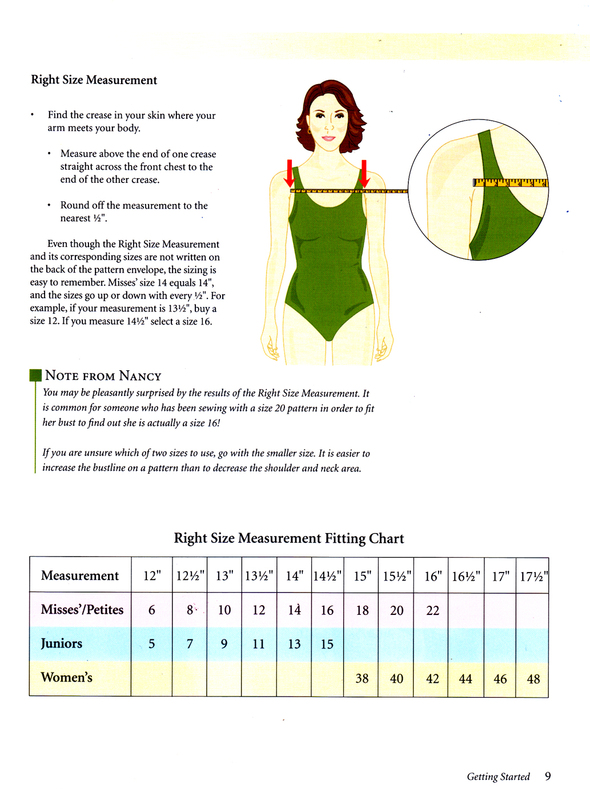 I had intended to mention this “Right Size Measurement Fitting Chart” from Nancy Zieman’s Pattern Fitting with Confidence when I wrote about the book earlier this week. You’ll want to have someone take this measurement for you, since it’s nearly impossible to take this measurement accurately yourself. You might even want to have a friend measure you twice to be sure it’s correct. Lisette patterns are drafted for a B-cup figure. If your bust is larger or smaller, you’ll need to adjust the patterns accordingly. This is one place where the books I’ve been blogging about will be helpful to you. Another useful resource you might be interested in is the Simplicity Fit Guide. You can download it as a free PDF from the Simplicity website. I’ll be curious to hear what you find. Have you been sewing the correct size? I saw this method on a Nancy Z. tv show on PBS last year, and I have been using it with great success. So true that it is better to get the fit for shoulders and upper bust, and then alter pattern for bust or hips. It really works. Plus I feel that current commercial patterns are mostly too wide at the top. I use her method of flat pattern adjustment but also have learned a lot from the Palmer and Pletsch books. Thanks for your posts, since fitting is top of mind for me right now. I own the Real Fit for Real People book and was so encouraged by what I learned there. It seemed so doable! So, I set out confident that I would be able to make my first successful full bust adjustment. I followed the instructions, made all my adjustments, and discovered that my definition of a ful bust and theirs are not the same. That brings me to my current state: thoroughly discouraged and still in possession of what must be an award-winning rack, despite how I might wish it. The amount of my FBA is so great (4 inches or so) is so great that it messes with the armholes. But if I use a larger pattern, then the shoulders and upper chest swim on me. Do you have any magical suggestions? I fear I will be relegated to a lifetime of sewing nothing but skirts and shower curtains if I can’t figure this out. Sorry for using your comment field as a couch, but I have rarely felt so discouraged. I can’t wait to try this out! I recently bought a vintage sewing book that said you should start off with the pattern that has the correct armhole for your body. But how to figure that out? I’ll try this method to start and see how the armhole fits. Hopefully I’ll finally end up with something that fits me correctly! She has a large bust and makes the most amazingly tailored clothing. You could probably find lots of great tips there! Good luck! Hmmmm….I measure 12″, or size 6. I’m not sure I believe it because I sewed a size 18 in the Portfolio top and it fits fine. It is big everywhere but my bust, but still – I can’t imagine going all the way down to a 6!! Oh, but I did have to reshape the neck band quite a bit because it was far too big on me in the size 18. Hmmmm…. Thank you so much for recommending thus book. It’s literally made the difference for me to start seeing again. All because no more wasted projects because they don’t fit. Thank you!! I’ve got this book and it’s so far off for me it isn’t funny. According to this method I’d need to sew a size 44. I’ve sewn 14’s that were a tad looser in the shoulders than I would have liked and I have broad shoulders, although 14’s generally fit quite well, with the exception of needing to take in the hips a bit. I just can’t imagine what it would look like if I went up 5 sizes!